Dhaka City: New attraction of Dhaka City...................WOW!!!! New attraction of Dhaka City...................WOW!!!! Hatirjheel is a large area situated at the heart of the capital city of Bangladesh, Dhaka. This was mainly created for public transportation. It was inaugurated on January 2, 2013. Hatirjheel made transportion much easier for the people living near Tejgaon, Gulshan, Badda, Rampura, Mouchak and Maghbazar. It was made possible by the Bangladesh army, 'Special Works Organization' (SWO). Building the entire site cost 19.71 billion (19710 million) taka in an area of 302 acre. In it 10.48 billion (10480 million) taka was spent in having the site. RAJUK has 46% of the area which includes an area of 81 acre to court of walks, 141 acre for public lands and 1 acre for BTV. The project first permitted in October 2007. The entire Hatirjheel is meticulously designed with about four main and four minor bridges (viaducts) and several overpasses for pedestrians. There are also many sitting arrangements for pedestrians by the river-side. A lake flows through the heart of the project with a 16 km road beside the lake for traffic. Besides, it has a picturesque view, and people from all over the Bangladesh comes to see this amazing place. Boat rides are available and facilities are there for small scale family picnics. 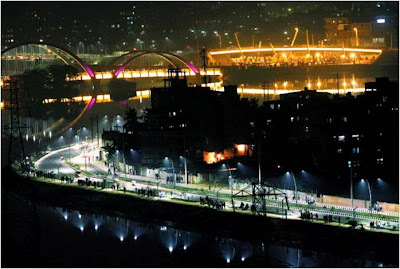 At night, lights of different colours illuminates the entire Hatirjheel, especially on the bridges. The area has been delightfully decorated with flowering shrubs and colourful flags. Once completed, the project became a place for the pleasure-seekers. As Dhaka is densely populated, and has so much buildings, that it seems to have no open spaces, but conveniently Hatirjheel has lots of spaces to contain fresh air, as a result the people could come and feel the fresh air. Hatirjheel is considered to be one of the most notable places in Dhaka.